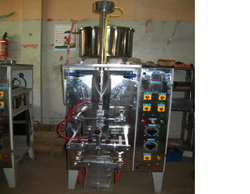 We bring forth an advanced range of pouch packing machine for industrial use at the market leading prices. Our pouch making machine is designed as per required industry guidelines to meet the specific work requirement of the clients in an effective manner. As per the variegated requirements of our clients, we are offering a broad collection of Mineral Water Pouch Packing Machine. Our valuable clients can avail this packaging machine from us in various specifications within a given time frame.